To create a new shift, go to the Schedule => Team Schedule page and click on any cell on the calendar. Or, click on the New button. Then click the Shift option. You should see a pop-up window with a form like the one below. Published If the shift is published, it is visible to team members. You can publish shifts in bulk, too. Learn about bulk publishing, here. Position Assign a shift to a position. Learn about positions, here. Location Assign the shift to a location. Learn about locations, here. 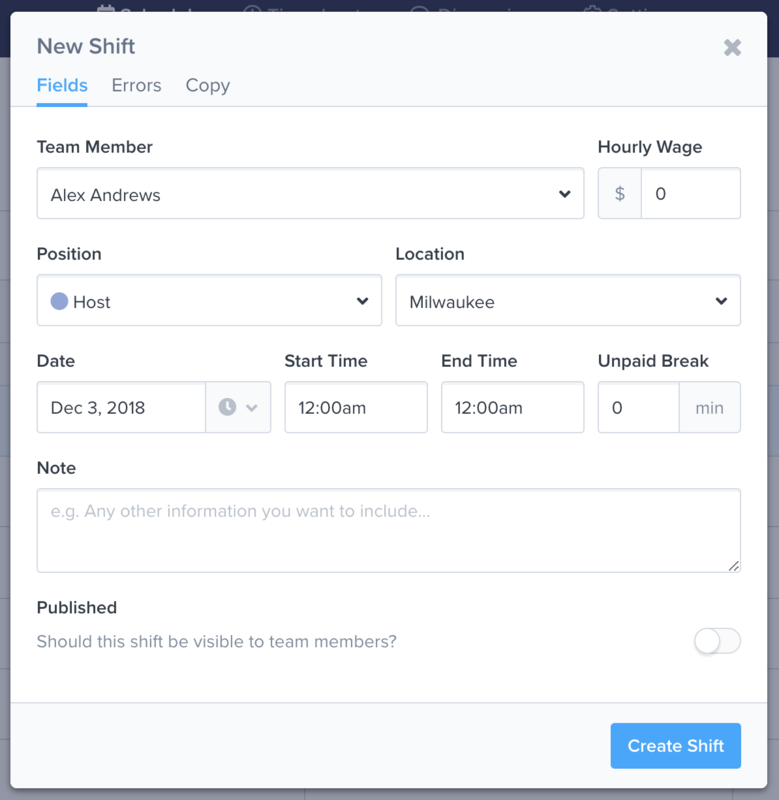 Hourly Wage The shift wage field defaults to the team member assigned to the shift. You can override any wages per shift if you'd like. Adding wages helps you forecast your labor costs. Unpaid Break This field is used to calculate hour totals correctly. Note The text in this field is visible to the team member assigned. The errors tab shows any errors that may be caused by other shift conflicts, time off request conflicts, availability conflicts, or overtime settings. Note: Your shift rule settings may block the shift from being created. You can update your shift rule settings or ignore the shift error rules from this tab. 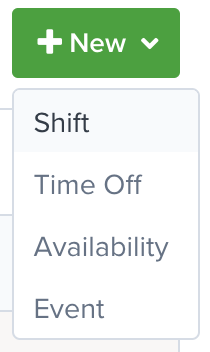 The Copy tab includes inputs for copying the shift across days and weeks. Learn about copying shifts and timesheets, here. Once you submit the form, the shift will be added to the schedule. Note: The shift will only be visible if it is not filtered out by any parameters (e.g., date, position, location, etc.). To edit a shift, click on it. You will see a pop-up up window with a form like the one above. Update the fields and submit the form. To delete a shift, click on it. Then click on the Delete button. Need to delete multiple shifts? Read this article.